While gathering inspiration for painted cabinets earlier this year, I stumbled across this stunning kitchen by Christopher Knight Interiors and Fox Force Five Construction. 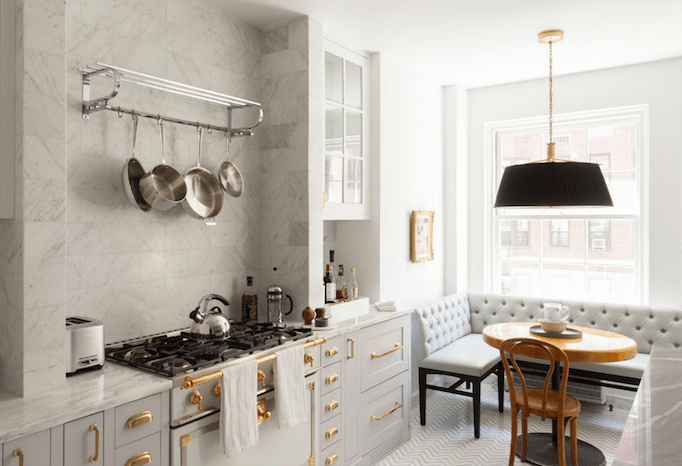 The space has classic details, but uses a unique combination of marble, gray, black, and brass. This kitchen is full of amazing inspiration, so thought I’d share it with you today. Enjoy! The cool palette of this kitchen creates a neutral foundation for the beautiful details to stand out. The light gray flat-panel cabinets are paired with marble counters and large-scale tile for the backsplash. The gray is carried through to the floor where the designer chose a small herringbone pattern that adds texture to the room. 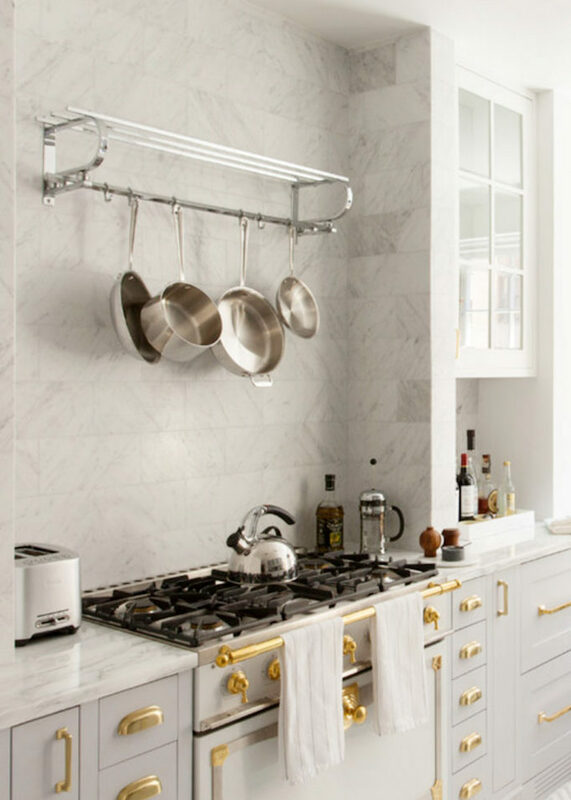 Against the gray, brass hardware on the cabinets pop. The pretty brass details continue on the white La Cornue CornuFe Stove. The stove also has touches of chrome that match the pots and rack above. This mix of metals brings a modern element to the classic design. 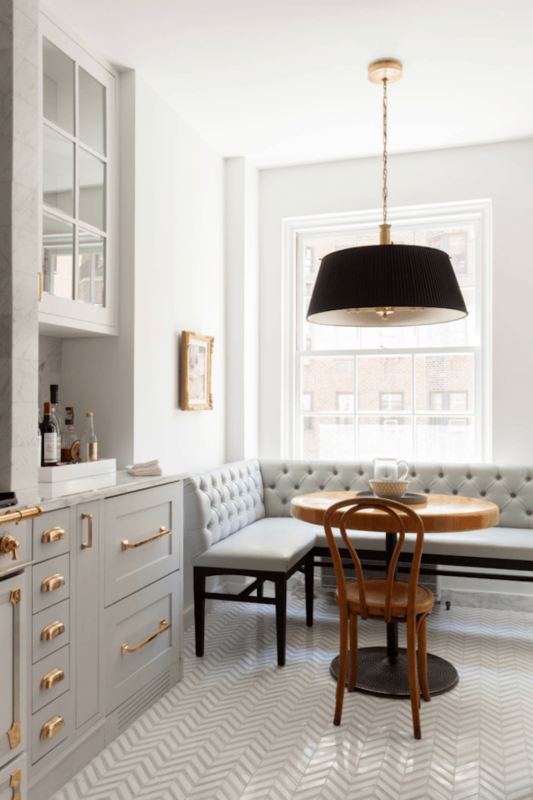 It is not easy to fit seating into a small galley kitchen, and so the banquette and bistro table are perfect. The wood of the table and chair add warmth to the monochromatic space. The large black shade pendant keeps creates a focal point and keeps the kitchen from feeling bland. It is also perfect for its brass details. Despite it’s small space and gray foundation, this kitchen feels warm and inviting. I hope you think it as gorgeous as I do. To view a complete portfolio of this home visit here. To see more ideas on painted gray cabinets in the kitchen, check out my post on Non-White Kitchen Ideas. 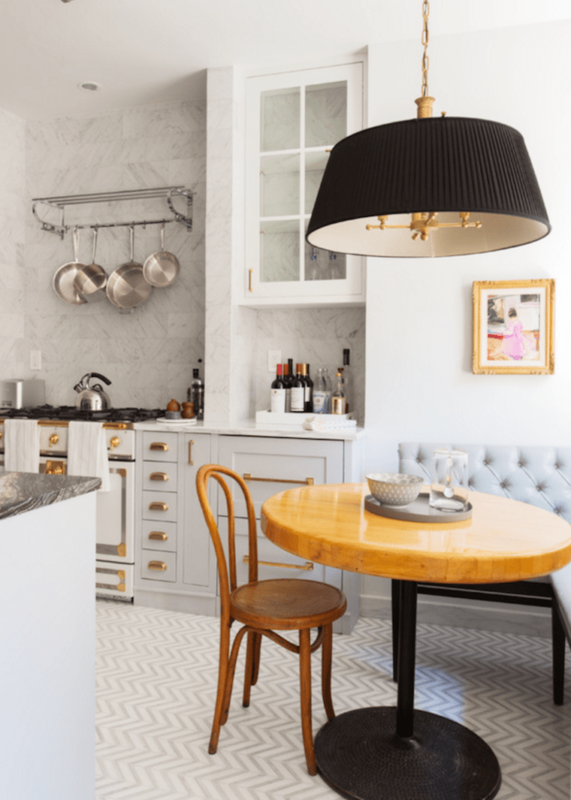 Also, if you are thinking of installing marble countertops in your kitchen, here is my Marble Q&A to use as a resource. I hope you have a wonderful Wednesday! Look at all the beautiful brass! I’m preparing my house to sell – purchased it in the late 1990’s when my daughter was young. My realtor things I need to change out all the 90’s shiny brass hardware, and she’s right. But to what? Nickel, the newer brass looks?